Photographic reproduction of an engraved portrait depicting Josiah Harmar, ca. 1790-1799. The original portrait was engraved by John Sartain and based on a painting by Raphael Peale. Harmar served in the Continental Army during the American Revolution. He was then appointed commander of the American Army in the Ohio Country where there was conflict between Native Americans and white settlers. In 1790 Harmar launched an attack on the Miami, Shawnee, Delaware and other native people in western Ohio. Initially the tribes retreated, but a successful counter attack led by Little Turtle of the Miami routed Harmar's troops and they retreated. Because of the heavy casualties his troops suffered, in 1791 he was court-martialed for misconduct during the campaign. Though the court-martial cleared him of all charges, Harmar retired from the army in 1792. 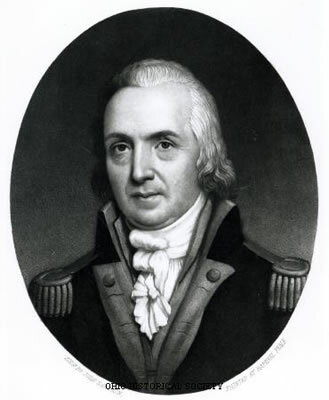 He returned to Pennsylvania and served as the state's Adjutant General from 1793 until 1799. He died August 20, 1813. Ohio History Connection SC 2884, AL02989 from the Josiah Harmar Collection.